There’s nothing like being a winner. The thrill of victory, intimate knowledge of a job well done, and then there’s the recognition. Our 2015 LearningElite winners understand the feeling well, as Chief Learning Officer’s spring symposium is also when the LearningElite Gala takes place and all of this years’ 71 bronze, silver and gold winners were recognized over wine and laughs from Second City. It was the perfect kick off to our bi-annual event – or as I think of it in my mind, our bi-annual, in-person learning extravaganza. I usually do a few video interviews with learning leaders at the event – watch for my talk with ESPN Founder Bill Rasmussen; what a nice guy, and what a wonderful, lesson filled story he has to tell – and it’s always tough to wrestle my interviewees away from the networking opportunities that alternate workshops and keynotes. I had to physically pull CHK Baptist Health CLO Justin Lombardo away from the crowd of people who wanted to pick his brain after he delivered a short, but strong Voice of the CLO presentation on what to do with yourself after you transition out of the CLO role. Hint, he found another CLO role – one with a finite end date. The keynotes were another hotbed of networking activity. I’ve always thought it’s a good sign if there’s a crowd around the speaker after they exit the stage, and that was certainly the case after Brigid Schulte (pictured), a reporter for the Washington Post and author of the book “Overwhelmed: Work, Love and Play When No One Has the Time” spoke so poignantly of her struggles to find time for life amidst the demands of a successful career. She made a real connection with the audience as she described missing once in a lifetime opportunities to jump on trampolines with her children and weed the garden in favor of working on endless, soul crushing to do lists that never got any smaller despite constant effort and attention. She spoke about the “modern” culture of work, which has created this dated but persistent characterization of the ideal worker – a male, without child care responsibilities – and how this characterization is putting the U.S. behind the curve in terms of creativity, performance, productivity and certainly work life balance. But it was her stats and chat about stress and its affects that really seemed to knock attendees over. You’ve probably heard the phrase stress is a killer? Well, Schulte clarified that it’s not only a killer of people physically. The effects are equally terrible for an organization’s ability to innovate, thrive, attract and develop the best talent, you name it. I think this event’s unofficial theme could have been learning with a side of health. Our other keynote speakers Heidi Reeder and Steven Kotler each a substantive take on why stress is detrimental to learning and well-being, and how important it is to cultivate meaning in work – not just be busy and show it. 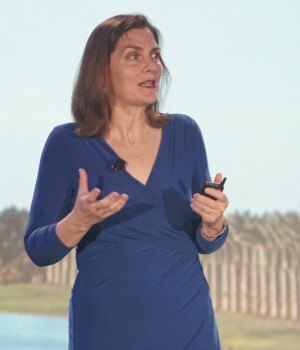 I was sad to leave sunny Miami – I returned to a cloudy and overcast Chicago – but I took a lot of wonderful information home with me from the 2015 Spring CLO Symposium. Had I brought the sun too, it would have been perfect.